Washington D.C., December 12, 2006 - As Chile prepared to bury General Augusto Pinochet, the National Security Archive today posted a selection of declassified U.S. documents that illuminate the former dictator's record of repression. 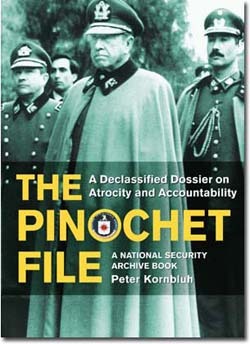 The documents include CIA records on Pinochet's role in the Washington D.C. car bombing that killed former Chilean ambassador Orlando Letelier and his American colleague Ronni Moffitt, Defense Intelligence Agency biographic reports on Pinochet, and transcripts of meetings in which Secretary of State Henry Kissinger resisted bringing pressure on the Chilean military for its human rights atrocities. "Pinochet's death has denied his victims a final judicial reckoning," said Peter Kornbluh, who directs the Archive's Chile Documentation Project. "But the declassified documents do contribute to the ultimate verdict of history on his atrocities." Most of the documents posted today are drawn from a collection of 24,000 declassified records that were released by the Clinton administration after Pinochet's October, 1998, arrest in London. Many of them are reproduced in Kornbluh's book, The Pinochet File: A Declassified Dossier on Atrocity and Accountability. Pinochet died of complications from a heart attack on December 10, which was, by coincidence, International Human Rights Day. This memo, sent to the Secretary of State by Jack Kubisch, states that summary executions in the nineteen days following the coup totaled 320--more than three times the publicly acknowledged figure. At the same time, Kubisch reports on new economic assistance just authorized by the Nixon administration. The memo provides information about the Chilean military's justification for the continued executions. It also includes a situation report and human rights fact sheet on Chile. An updated fact sheet showing the situation two months later is also included. This Intelligence Report states that between September 11, 1973 and October 10, 1973 a total of 13,500 prisoners had been registered as detained by the Chilean armed forces. During that same time period, an estimated 1,600 civilian deaths occurred as a result of the coup. The report also notes that eighty civilians were either executed on the spot or killed by firing squads after military trials. This secret CIA report acknowledges that Chile's National Intelligence Directorate is behind the recent increase in torture, illegal detentions, and unexplained "disappearances." The report notes that the increase in gross violations of human rights in Chile comes at a particularly bad time for the country. This DIA report on Chile's Directorate of National Intelligence (DINA) discusses the organization's structure and its relationship with the Chilean Armed Forces and the country's governing Junta. DINA is identified as the sole agency responsible handling internal subversive matters. The report warns that the possibility of DINA becoming a modern day Gestapo may be coming to fruition. It concludes that any advantages gained by humanitarian practices in Chile could easily be offset by DINA's terror tactics. This DOS cable sent two days after the coup states that the "US government wishes to make clear its desire to cooperate with the military Junta and to assist in any appropriate way." This official welcome agreed that it was best to avoid too much public identification between the Junta and the United States government. This DOS cable was sent in response to a note from the Junta regarding the continuation of relations. It stress the US government's "strongest desire to cooperate closely with the Chilean Junta." ARA analyst Richard Bloomfield's memo notes that "in the eyes of the world at large, we are closely associated with this Junta, ergo with fascists and torturers." In this memo he makes clear his disagreement with Kissinger's position and argues that the human rights problem in Chile should be of primary interest to the U.S. government. In this secret memorandum of conversation, Kissinger briefs Pinochet in advance of his speech to the Organization of American States (OAS) in Santiago in June 1976. He lets Pinochet know that he will treat the issue of human rights in general terms only. He stresses that his speech is not aimed at Chile but that it is intended to appease the U.S. Congress. But, he notes, "we have a practical problem we have to take into account, without bringing about pressures incompatible with your dignity, and at the same time which does not lead to U.S. laws which will undermine our relationship." Two weeks after the car bombing assassination of Orlando Letelier this CIA field report states that its source "believes that the Chilean government is directly involved in Letelier's death and feels that investigation into the incident will so indicate." This CIA intelligence assessment alludes to the strain placed on U.S.-Chilean relations in light of recent findings in the investigation of the murder of Orlando Letelier that firmly linked the former Foreign Minister to the highest levels of the Chilean government. 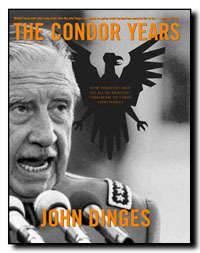 CIA analysts write, "The sensational developments have evoked speculation about President Pinochet's survival." This secret intelligence report outlines Pinochet's strategy to cover up his regime's complicity in the Letelier assassination. The four-point strategy would protect General Contreras from successful prosecution in the murder, stonewall requests from the U.S. government that would help them build a case against Chileans involved in the terrorist act, prevent the Supreme Court from honoring U.S. extradition requests, and convince the Chilean people that the investigation into the Letelier assassination is a politically motivated tool to destabilize the Pinochet regime. Two versions of DIA's biographic profile on Pinochet - one fully uncensored, the other curiously redacted. Please see the Archive's prior posting regarding the two different versions of the document. This CIA bio describes Pinochet as an intelligent, disciplined, and professional military officer who is known for his toughness. The document states that Pinochet is dedicated to the national reconstruction of his country and will not tolerate any opposition to that goal.